Footloose is the title of two soundtracks, the first, released in 1984, to the 1984 film Footloose and the second, released in 2011, to the 2011 remake. Footloose: Original Soundtrack of the Paramount Motion Picture is the original soundtrack of the Paramount motion picture Footloose. The original nine-track album was released in 1984 and reached number one on the US Billboard 200 chart on April 21, 1984, where it stayed until June 30, 1984. When it was re-released in 1998, four bonus tracks were added to the album. In 2002, Sony International released the Australian Souvenir Edition (aka Australian Cast Special Edition). Two megamixes were added to the album, featuring the Australian cast of the Footloose musical. 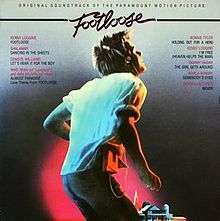 The original soundtrack contained six Billboard Hot 100 Top 40 hits, three of which reached the Top 10, including two number-one hits, "Footloose" by Kenny Loggins and "Let's Hear It for the Boy" by Deniece Williams, and "Almost Paradise", a duet by Ann Wilson and Mike Reno that reached number seven. In 2009, Doveman released a reimagining of the soundtrack album. The original soundtrack for the 2011 remake was released by Atlantic Records and Warner Music Nashville on September 27, 2011. Footloose: Music from the Motion Picture, the original soundtrack for the 2011 remake, was released by Atlantic Records and Warner Music Nashville on September 27, 2011. It includes eight new songs and four remakes of songs from the original film's soundtrack. "Footloose" by Kenny Loggins was covered by Blake Shelton for the remake, which is an upbeat country version. The film opens with several teens dancing to Loggins's original version of the song. Like the original film, the 2011 version also features "Bang Your Head (Metal Health)" by the heavy metal band Quiet Riot and the original "Let's Hear It for the Boy", which are not on the soundtrack album. ↑ Fiander, Matthew (August 24, 2008). "Doveman: Footloose". Retrieved April 26, 2016. ↑ Stosuy, Brandon (June 27, 2008). "Doveman Covers The Footloose Soundtrack]". Retrieved April 26, 2016. ↑ "Canadian album certifications – Various Artists – Footloose - Original Motion Picture Soundtrack". Music Canada. ↑ "Les Albums Platine :" (in French). Infodisc.fr. Retrieved 2 May 2012. ↑ "IFPIHK Gold Disc Award − 1985". IFPI Hong Kong. ↑ Davis, Edward (August 9, 2011). "'Footloose' Soundtrack Features Cee Lo, Smashing Pumpkins & More; Due September 27th". indieWire. Snagfilms. Archived from the original on September 24, 2011. Retrieved September 24, 2011. ↑ Schillaci, Sophie (September 6, 2011). ""The Voice" coach puts a country spin on Kenny Loggins' original for the upcoming film remake". The Hollywood Reporter. Prometheus Global Media. Archived from the original on September 24, 2011. Retrieved September 24, 2011. ↑ "Footloose  [Original Motion Picture Soundtrack]". Allmusic. Rovi Corporation. Retrieved September 24, 2011. 1 2 3 4 "Chart listing for Footloose". Billboard. Prometheus Global Media. Retrieved October 6, 2011.